Proper commercial carpet cleaning care is often a difficult but important part of facility management. The cleanliness (or ultimately the lack of cleanliness) of a commercial carpet has the ability to create an immediate good or bad overall impression of a business, so understandably it needs to be done right. However the multitude of carpet cleaning choices available, coupled with the sheer amount of conflicting information on the internet, can make what seems like a simple job, incredibly confusing. 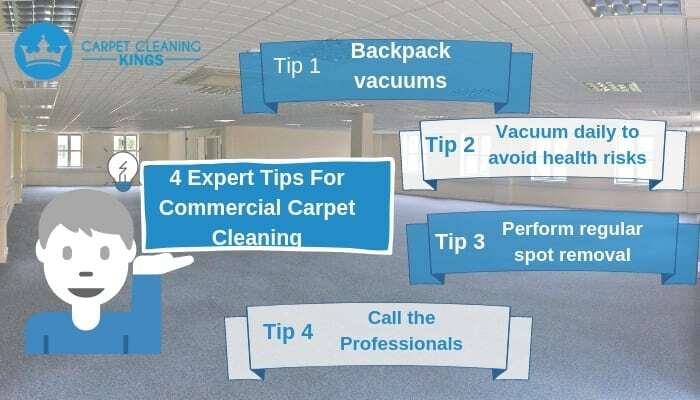 With this in mind, here are 4 tips from the pros on how best to look after your commercial carpet. According to Eric Hickman a product manager and cleaning consultant for Power-Flite, offices with congested areas such as those spaces with large clusters of workstations can cause problems for cleaning access, particularly those using using conventional vacuum cleaners. As a result backpack vacuums help to reduce carpet cleaning times in many office environments. They’re lightweight and give quick access to tools and accessories needed to find those hard-to-reach areas. For heavily congested areas particularly hotel foyers, lobbies, and stairways, carpets should be vacuumed daily. This helps to keep the build up of dust and dirt at bay, which could otherwise penetrate deep into the carpet fibres causing fibre damage. In addition, a well used carpet acts like a filter capturing all the general dirt from foot traffic along with hair, dander, and dust mites, making it a health risk, particularly to those with respiratory problems. In addition a dirty carpet can also cause skin irritation and bring about allergies. “When it comes to carpet spots or stains, speed is of the essence” states Gary Borofsky of Bonnit Brush Systems. Spots or stains that are left will slowly work their way deep into carpet fibres. As a result they become far more difficult and in some cases impossible to remove. In addition sticky spills will act like a magnet attracting any dust particles, leaving an unsightly brown stain or mark. It’s necessary when spills occur to remove them fast using the appropriate cleaning methods. If you feel it’s about time your commercial carpets were properly cleaned or you’d like to speak to a professional company about a regular maintenance program then contact Carpet Cleaning Kings. With years of experience within the industry we know just what it takes to keep your carpets looking like new. For a free, no-obligation quote contact us on 1300 7000 75. Don’t let a dirty carpet tarnish the reputation of your business. Pick up the phone and call us today!